Pretty pink floral watercolor wreath, plus hearts and a banner. Just in time for Valentine’s Day. 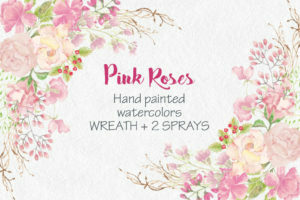 Cutesy pink hand painted watercolor clip art floral wreath. Perfect for creating the most romantic Valentine’s Day cards. The listing includes a pink banner, plus 5 little hearts – all given as separate items (watercolor elements). Use these to decorate a fun valentine card. The banner and the hearts (separate elements) are given in PNG format. The banner measures 3.3 X 7.2 inches (975 X 2170 pixels). Pink heart 1 measures 1.6 X 1.5 inches (470 X 447 pixels). Pink heart 2 measures 1.4 X 1.2 inches (431 X 374 pixels). Pink heart 3 measures 1.3 X 1.4 inches (375 X 415 pixels). The shocking pink heart measures 1.6 X 1.6 inches (478 X 476 pixels). The purple heart measures 1.4 X 1.6 inches (426 X 476 pixels). 1 zipped folder is immediately available following purchase containing the wreath (JPEG and PNG), the banner and the 5 hearts (PNG) – 8 files.